Join the OP for a mountain bike ride at Alsea Falls! The ride is open to all levels (first-timers too!) We will cover riding basics/techniques for anyone who wants it, and an introduction to some great Oregon trails for all! Sign up at the Outdoor program Barn or EMU Outdoor Program office. Mandatory Pre-trip meeting is Thursday February 7th at 6:00pm at the Outdoor Program Barn. The ride will be around 9 miles round-trip and will have about 1500’ of elevation gain. Trip cost will cover all transportation, and we can connect you with a local shop if you don’t have your own mountain bike and the need to rent one! It will be necessary to reserve a bike before your trip. Paul’s Bike Shop on Charnelton can rent Trek Roscos ($49 for Hardtail) and Trek Fuel EX ($79 for Full Suspension). They will offer a 10% discount on rentals for students. You are not signed up until you pay at the Outdoor Program EMU space, Room 008, or the Outdoor Program Barn on 18th and University Street. Hours are M-F 12pm-5pm. 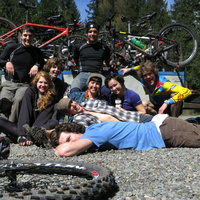 Students are automatically members of the Outdoor and Bike Program. If you are not a student you have two options: Pay an extra $5 for the event as a one-time day-use fee. Or, you can purchase an annual year-to-date membership for $25 by coming into one of our above listed locations. You will also need to purchase a one-time community member card from Card Services in the Erb Memorial Union for $10. The card and membership will enable you to access our Rental Barn for affordably priced outdoor gear, the Do-It-Yourself Bike Workspace full of professional tools, and entry to Outdoor Program events and Common Adventure trips. Questions? Email opwww@uoregon.edu, or message us on the Outdoor Program facebook page.